Youth is a special time in a person’s life. 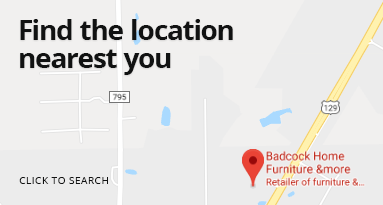 Make your child’s bedroom just as special as they are with stylish youth furniture from Badcock Home Furniture &more! Our youth collections are perfect for the toddler, child, or teenager in your life. With stylish youth furniture they’ll love and prices you’ll adore, a kid’s bedroom set from Badcock is sure to bring happiness to your home. Our youth collections are high in quality but low in price and are sure to impress even the pickiest prince or princess in your life. 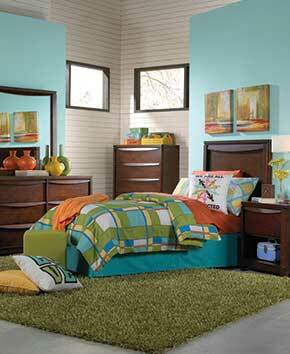 Shop online now for the perfect matching youth bedroom set. We have everything you need to create the most enchantingly stylish room for your child including youth beds, dressers, nightstands, &more! Make your child’s bedroom a dream come true with our easy financing! Inspired by French classic Louis Philippe furniture, the Lewiston collection offers grand silhouettes, subtle curvatures and striking design. Design features include the characteristic wide ogee shaped moldings on the underside of the case pieces, sweeping toe plate cut-outs and neatly inset drawer fronts. Lewiston features quality engineered wood products and simulated wood grain veneers finished in a sleek cherry color. Slender bail handles in a brushed nickel color complete the lean updated profile of the case pieces. The headboard of this collection allows for placement of decorative pillows so your bed always looks as fabulous and stylish as you. This group includes complete full panel bed, dresser and mirror. Other pieces sold separately. Inspired by French classic Louis Philippe furniture, the Lewiston collection offers grand silhouettes, subtle curvatures and striking design. Design features include the characteristic wide ogee shaped moldings on the underside of the case pieces, sweeping toe plate cut-outs and neatly inset drawer fronts. Lewiston features quality engineered wood products and simulated wood grain veneers finished in a sleek cherry color. Slender bail handles in a brushed nickel color complete the lean updated profile of the case pieces. The headboard of this collection allows for placement of decorative pillows so your bed always looks as fabulous and stylish as you. This group includes complete twin panel bed, dresser and mirror. Other pieces sold separately. The Lewiston Grey Collection brings a soft, comfortable touch to your bedroom for a look you’ll love. With a grey finish, it’s constructed of cherry veneers over Asian hardwood with engineered wood products. Stretch out in serenity with our lovely bed. The grey finish offers a unique option for creating a one-of-a-kind bedroom. It has a pared-down sleigh bed profile and is available in twin, full, queen and king sizes. Always in style, our dresser has six roomy inset drawers in grey finish with slender ball handles in a brushed nickel color. The mirror has a wood frame for a simple finishing touch. This 5pc includes the full bed, dresser and mirror. The Lewiston Grey Collection brings a soft, comfortable touch to your bedroom for a look you’ll love. With a grey finish, it’s constructed of cherry veneers over Asian hardwood with engineered wood products. Stretch out in serenity with our lovely bed. The grey finish offers a unique option for creating a one-of-a-kind bedroom. It has a pared-down sleigh bed profile and is available in twin, full, queen and king sizes. Always in style, our dresser has six roomy inset drawers in grey finish with slender ball handles in a brushed nickel color. The mirror has a wood frame for a simple finishing touch. This 5pc includes the twin bed, dresser and mirror. The Mossy Retreat full bookcase headboard provides a convenient space with built-in shelves and storage. It is constructed of sturdy yellow pine in a slate finish. This six-drawer dresser provides the storage space a young man’s room needs. The full-size mirror is the perfect addition to the Mossy Retreat dresser. It measures 26.5”x 38.25” and helps to create the illusion of a larger room. This 3 piece group includes the full bookcase headboard, dresser and mirror.